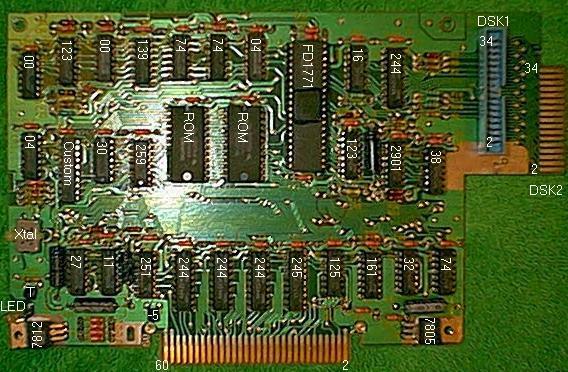 244: three 8-bit buffers, 74LS244 for the address bus and control lines. 245: A 8-bit transceiver, 74LS245 for the data bus. 125: A quad 74LS125 buffers, for 3-state output signals (e.g. RDBENA* , READY*, EXTINT*). 7805: Voltage regulator, TL780-05C, +5 volts. Nearby, is a 47uF bypass cap. 7812: Voltage regulator, 78M12C, +2 volts. Nearby, is a 47uF bypass cap. 259: An 8-bit addressable latch, 74LS259 for CRU output operations. 251: An 8-to-1 multiplexer, 74LS251 for CRU input operations (unbuffered CRUIN line to the PE-box). T: A transistor 2N3904 to control the LED. LEDs: A yellow light-emitting diode reacts to CRU bit 0. Custom: Custom control IC: 1500280-1 DCM00MI8240. 27: Half a dual 3-input OR gates 74LS27. 30: An 8-imput AND gate 74LS30. 11: One gate out of a triple 3-input AND gates, 74LS11 (another gate handles the reset signal, with a 47 uF cap. The third gate is unused). DSK1: A 34-pin connector for the internal drive (odd pins are all grounded). DSK2: A 34-pin card-edge for external drives (odd pins on the back side, all grounded). 74: Two dual flip-flops 74LS74. 123: Three one-shots out of two dual one-shot 74LS123. The last one generates the motor strobe pulse (47 uF cap). 04: Three inverters out of a 74LS04. All the above serve to demultiplex the READ signal from the drive. 244: An 8-bit buffer 74LS244 for input lines from drive. 38: A triple-NAND gate, 74LS38. Output to the drive. On some boards: two piggy-backed chips (???). 16: Hex-inverter 7416 (not LS). Output to the drive. 2901: A 12V buffer LM2901N. Drive selection feedback to the 74LS251 (???). ROM: Two 4K ROMs, one for odd bytes, one for even bytes. Labelled DBT8240 (both), CD3233A & CD3234A. Controlled by the custom IC. FD1771: Floppy disk controller. Western digital, FD1771B-01, socketed. 04: Two 74LS04 inverters mounted as a flip-flop driven by the crystal. 00: Two NAND gates, out of a 74LS00. Mounted as inverters to buffer the clock signal. 161: A counter74LS161 to divide the crystal frequency. 139: Half a dual 2-to-4 decoder (controls WE* and RE* lines). Also uses a 74LS32 OR gate. 04: Three inverters (from 3 distinct chips). For more details, see my page on the FDC card. Revision 1. 8/25/01. OK to release.